You are here: Home > Blog > Community use > What do you think of the forestry commission sell-off? This government proposal has raised enormous public interest and a large amount of misinformation: celebrities seem to be taken as the experts and the forestry commission officers sometimes treated as the villains of the piece. Two months ago we decided to research the issues and the history of Forestry Commission sell-offs in the last 20 years and we have produced a very factual report which we hope will help the debate. It includes figures on which parliamentary constituencies are most affected, likely financial receipts and past history of Forestry Commission sales. We also quantify the amount and type of forestry land which may be sold and examine the sorts of buyers who may be in the market. The report is entitled, "Encouraging wider ownership of woodlands"
What the study concludes is that the debate so far takes too little account of private ownership by families and individuals as a solution to the future ownership and management of these woodlands. It seems to us unlikely that charity groups will be able to take on very many of these Forestry commission woodlands - important though their work is, charities have neither the financial reserves nor management resources to take on a very large percentage of the woodlands that may be sold off. Whilst we do not support the selling off 100 % of the Forestry Commission woodlands, and not all will be suitable for private owners, our experience is that where private owners take on ownership of woodlands it usually leads to a very useful alternative model of ownership - private owners of smaller woods tend to be very hands-on managers and very active in conservation and learning about their woodlands ; whether there is public access or not. Please do comment here on our blog, letting us know what you think of our report and your thoughts on the sell-off. Well it would seem the FC already has these ideas in hand with regional policy. I all politeness I think you may be underestimating the UK’s resources, skills, and potential. Yes, but where are the skills and investment finance for such a revolution? A few small scale projects won’t achieve the desired effect. I think you underestimate the cost of clearing woodland to an acceptable environmental and commercial standard even for campsites. To be commercially viable on a significant scale these would need good quality facilities. Obtaining planning permission alone would be prohibitively expensive, even if it were achievable. The UK simply does not possess the number of financially skilled entrepreneurs, knowledgeable in forestry, to create an undertaking, or series of undertakings, of sufficient size and scope to achieve the twin objectives of commercial profits and public access. This is not to denigrate the efforts of owner occupiers who are doing such a good job of improving and preserving small woodlands, but merely recognises the skills shortage and lack of available finance for dealing with something the size of the publicly owned forestry estate. 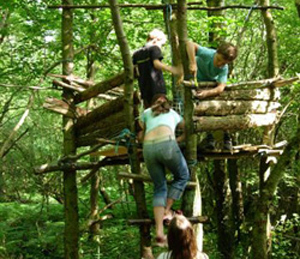 The Forestry Commission already has the land management skills, and with specialist help have created leisure facilities such as ‘high ropes’ that proven popular and successful. I would have thought suitable sections of forest could be leased for woodland holidays, and pockets / glades could be cleared to make wonderful woodland campsites at very little cost but bring the money in, without causes much damage and without selling the land. Wood production needs to stepped up / made more efficient lean process, encourage/promote wood chip slow burn efficient home heating for example. As I understand it the FC was set up during the War to ensure a good supply of wood for making trenches etc. The model/role of the FC just needs to change to become a profitable business model – just like the post office. Nice thought Richard, but where are the skills and investment finance for such a revolution? Simple answer is to revamp the Forestry Commision and make better use of the forests and make them profitable with more leisure / public access combined with some grander scale wood production / planting schemes. No need to sell them – anther golden goose – keep it & feed it! Which reminds me – the Post Office is now making a handsome profit – why sell that? Seems a bit daft to me! I have heard a lot of arguments in this debate about the sell off from a lot of people with their own interests in mind. Be they the larger organisations EG woodland trust, National trust etc, or smaller groups and individuals Eg cycling/walking or riding groups etc. I have also heard a lot of arguments for and against the forestry commision. Nearly all off the comments have been about either access to woodlands for leisure/recreation use in whatever form OR about wildlife conservation and ecology. Its an expensive thing to maintain. Hence in Governments eyes it will Allways be seen as a luxury that we as a nation cannot afford. There is a big part of the argument for keeping OUR National forest reserve in Public hands and managed by an organisation like the Forestry commision. Nowhere in the debate have I yet seen the building regs get mentioned. Surely its an important element in the future of OUR forest reserve. With the issue about carbon use coming into our building regs more and more we all need to look ahead much further than government tend to do (I am talking about government of whichever party persuasion here). If we are to build more of our houses and other buildings to much tighter carbon use limits are we not very likely to use timber rather than concrete or steel for far more of our construction work? How will all this new demand for construction grade timber be met? By Imports? I think you can see where I am going with this now. In 50/100 years time when we might be wanting to build almost entirely with timber and other countries are upping the price/limiting supplies to cope with there own domestic demand etc, If we do not hold a national reserve of suitable timber we will be in much the same position as we were when the Forestry Commision was invented. If the management (and therefore the selling) of OUR timber reserves is in private hands then we will be at their mercy. How many privatised industries are now in foreign hands? Surelly this must be a very important issue that as far as I can see simply isnt on the agenda. I believe there the is a place for all diferent perspectives on woodland use/management but I would imagine that the best way to argue the case with government is to put a good economic case for retaining the forest in Forestry commision Hands. Further more I would argue that the Forestry Commision has been blamed alot over recent years for mistakes in its early years in planting the wrong species of trees. However It may prove very soon not to have been such a huge mistake. Ps I have no personal interest in the Forestry commision, i do not work for them nor do any of my family/friends. What a lot of hot air, clearly the vast majority of respondents against the government proposals have looked no further than the ill informed press comments. Some of the best woodlands and parks in our country are privately owned and as long as the access rights are preserved I support the proposals. The Forestry Commission have never turned a profit in spite of their overall commitment to manage and sell timber. I live near Wareham Forest in Dorset, a forest dominated by fir, quick growing but so drab! Where are the deciduous tree? Over the past few years the Commission has erected many miles of wire fencing and you could not count the number of timber gates that have been erected barring cyclists, horse riders and walkers. There is currently the remnants of a ‘New Age Travellers Convoy’ that was abandoned in the summer of 2010 sitting on the side of a track. Is this good management of our woodlands? I don’t think so. I am not anti Forestry Commission but we should not be afraid to consider other forms of management of our woodlands, after all we all pay for them. Indeed Ira, and you can bet they won’t be “affordable” houses either. I was first to post on here and, it seems, there’s definitely a consensus of opinion. It is good to see something that can unite us despite the efforts of our great leader(s) who talk unity whilst creating division. The Government has already made their mind up that this selling of of public property will go ahead and the consultancy is only a marketing tool to see how they can make it more acceptable to the British people, in a few years time a future Government could make it possible for charity forest trusts to build houses on this land as a means to make it a financially viable operation. The National Forests are not the Government’s to sell! They belong to the people and should be kept for the people. Private owners will be in it for the profit and not the future of the woodland. Forestry Commission disposals – more surprises!